Every successful company will have 2 key major objectives : one is to DO WELL (the business/financial side of thing) and the other is to DO GOOD (the social responsibility side of thing). Of course, with shareholders to answer for, most listed companies will put more focus on Doing Well than Doing Good, which is understandable. With one exception for those non-profit organisation or social enterprise whereby their mission should have a balanced pillar of Do Good and Do Well. The question is, when you folks are evaluating a company for investment, do you pay attention to their Do Good factor too? 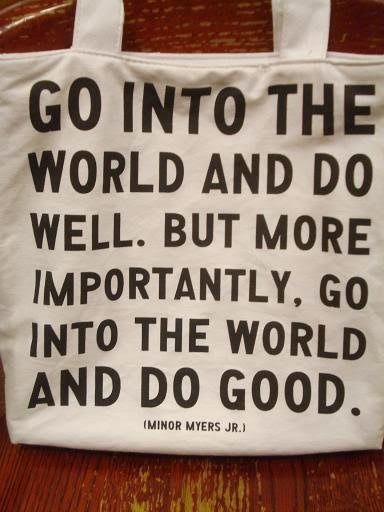 Example of Do Good elements are championing or sponsoring those charitable events/programs/drives. Some might view that these are just for PR or publicity stunt, but to me a company management with heart (i.e. setting aside certain budget for DO GOOD purpose every year) will attract me more. P/S: In fact, the same applies to individual too, we all should not only focus on doing well (i.e. by accumulating wealth) but should also pay attention on doing good (i.e. by giving to the less fortunate or needy). Coincidentally I just did a course on ethics so this topic comes out a lot on debates. Its interesting to know that companies which does good (e.g no corruption etc) do tend to make greater profits for shateholders. This two seem to come in tandem and investors and customers are appreciating the efforts done by the management. B : hahaha.. What a coincident! I guess this topic will be constantly in debate..